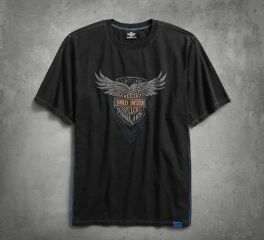 Join with Harley-Davidson® in celebrating 115 years of motorcycling freedom. Pick from of great range of 115th anniversary branded merchandise to celebrate this historic milestone. Celebrate 115 years of HARLEY®’s rebellious spirit in our special edition, heavyweight, abrasion-resistant, buffalo leather jacket. Emboldened with our anniversary eagle, and equipped with extra protection with EN 1621-1 CE approved removable body armor at elbows and shoulders. Add even more protection with the back-body armor pocket by fitting CE Level 1 back armor (98150-17VR, sold separately). Meets or exceeds CE requirements in abrasion resistance, impact testing, and seam bursting for personal protective clothing. Slightly pre-curved sleeves for comfort and easier movement. 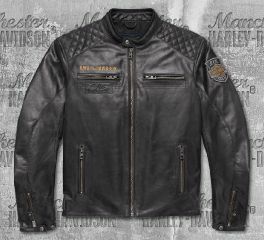 Harley-Davidson® 115th Anniversary Eagle CE-Certified Leather Jacket is infused with 115 years of Harley® legacy. 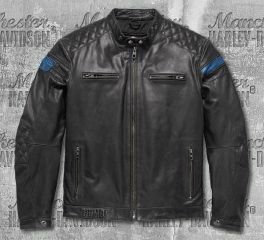 This heavyweight buffalo leather jacket offers extra protection with EN 1621-1 CE approved removable body armor at elbows and shoulders. Add even more protection with the back-body armor pocket by fitting CE Level 1 back armor (98150-17VR, sold separately). Leather Meets or exceeds CE requirements in abrasion resistance, impact testing, and seam bursting for personal protective clothing. Keep your stuff in order, celebrate our 115th, and be the hero who's always ready to pop a cap. 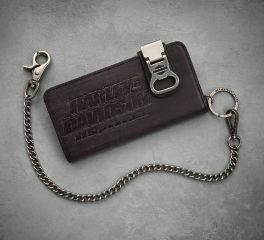 The 115th Anniversary Biker Wallet with Bottle Opener features an ingenious design. The bottle cap opener as part of the snap closure. But it conveniently flips up when it's time to pop a cold one. Constructed from durable cowhide leather, this wallet for men includes a rugged biker chain and ample pockets for cards, bills, and receipts. Beautifully debossed to mark our milestone anniversary. An anniversary this big is worth celebrating. We do it up with our specially designed 115th Anniversary 3-Piece Ride Pack. 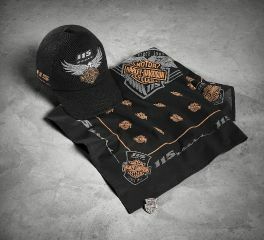 It includes a men's baseball cap, biker bandana, and commemorative pin. Each piece features signature graphics and colours of our 115th Anniversary. 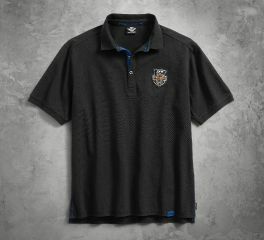 Celebrate over a century of innovation and individuality in our 115th Anniversary Polo with Coldblack® Technology. Perfect to wear in blazing summer sun, this classic helps keep you cooler (up to 9ºF!) thanks to the unique coldblack® treatment. 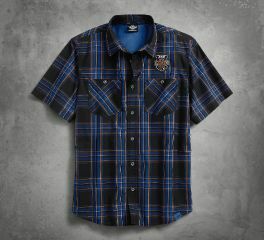 To jack up the style on this men's short sleeve shirt, we add anniversary graphics, contrasting side stitching, and a blue twill placket. Our 115th Anniversary Performance Vented Chest Stripe Shirt isn't just eye candy. This button-front shirt has a secret weapon; a vented action back. A smart pick for rides in warm weather, this men's long sleeve shirt helps circulate air and keeps you feeling refreshed. Zoom in for a look at the 115th Anniversary details; from hardware to patches to custom embroidery. Button front and cuffs. Snap-down collar. Two button chest pockets. Celebrate our big 1-1-5 in a fresh black tee. The 115th Anniversary Tee is cut from soft 100% cotton jersey with a light enzyme wash so it's comfortable all day. 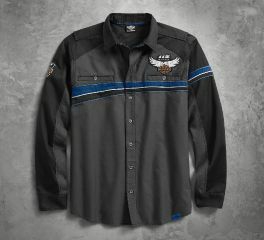 Signature anniversary eagle graphics and contrasting stitching infuse this men's short sleeve shirt with style to go the distance. 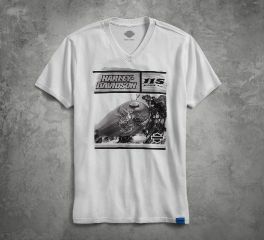 This one commands attention with the photo-real printed graphics on front. Look closely and you'll see it's a pickup of our 115th Anniversary gas tank art. This men's short sleeve shirt gets a modern update thanks to the stylish V-neck and close-fitting slim fit (no more boxy, oversized tees). Like it roomier? Size up. This one is priced right for our big bash. Epic style, awesome value! Treated with a light enzyme wash, our 115th Anniversary Plaid Shirt feels like an old favorite on the first wear. The yarn-dyed plaid is an easy pattern to mix with jeans in any wash. The contrasting back yoke lining adds a pop of color (even if you're the only one who sees it). We finish it off with 115th Anniversary accents hardware, label, patch, and embroidery. Featuring two breast pockets.